Dr. Brooke Dobni is a person who exudes positivity and determination. As a thought leader in the area of strategy and innovation, he sees the necessity in bringing people together to challenge conventional thinking, and develop new perspectives and fresh ideas. 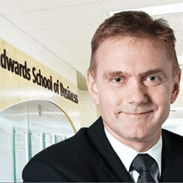 Dr. Dobni is a Professor of Management at the Edwards School of Business, University of Saskatchewan. Most recently, he held a term as the PotashCorp Chair for Saskatchewan Enterprise. He is the past holder of the Wilson Centre for Entrepreneurial Excellence Scholar at the University of Saskatchewan. His administrative contributions at the U of S have included serving as the Department Head of Management and Marketing, the Associate Dean of Professional Programs, and the Acting Dean at the Edwards School of Business. Dr. Dobni was instrumental in bringing the downtown K.W. Nasser Centre campus to reality in 2009. Dr. Dobni has business interests in both Canada and the United States. He has provided professional services to executives and boards of Saskatchewan’s largest organizations including Federated Co-op, Cameco, and PotashCorp, as well as the provincial government, in the areas of strategy and innovation. His research focuses on defining the relationship between strategy, innovation, and performance in organizations. He has completed three international surveys of innovation in organizations, one with Fortune 1000 companies in the United States, a global survey with members of the U.S. Conference Board, and a global survey of organizational innovation across 10 countries. He has published over 25 academic articles on strategy and innovation. He holds a Doctorate in strategy from the University of Bradford, Bradford-Leeds, UK. He founded Strategian in 1995, and InnovationOne.US in 2015.